Mrs. Anna C. Wagner o Cincinnati, O. who, with her six children, formerly resided in Williamson, received word September 1 from the Navy Department, advising her that her son, Warren Edward Wagner, Motor Machinist's Mate Second Class, has been presumed dead. 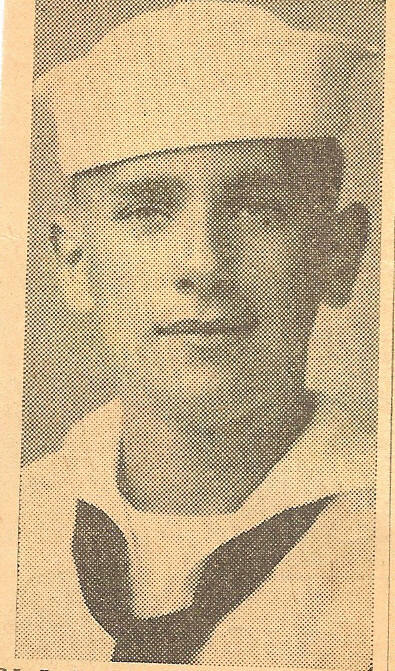 Young Wagner, who attended the East End grade school when the family resided at 437 Peter Street and the local high school when the family moved to 125 West Sixth Avenue, lost his life on August 15, 1944 while his vessel, an LST, was participating in the Allied Invasion of the beaches and coastal areas of Southern France. The LST on which Wagner served was transporting troops to beaches in August, '44. During its run for the beach, the LST was struck by a glider bomb launched from an enemy bomber. Wagner was at his battle station in the engineer's room at the time. The LST burst into flames, grounded and burned. Friendly vessels assisted in rescuing the survivors but Wagner was not among those saved. Motor Machinist Wagner enlisted in the Navy on December 14, 1942 at the age of 17 years. He left Williamson (WV) for boot camp the following January. Upon completion of this training he was assigned to the diesel engine course at Solomons Branch, Washington, D. C. From there he went into advanced diesel engine school at Norfolk, Va. In October, '43 he was assigned to the USS LST 282 and shortly after, the vessel began its journey at Pittsburgh down the Ohio, anchoring one night a few miles below his home in Cincinnati. He spent a last few hours at his home. The LST continued to an overseas destination and in August, '44, Wagner gave his life. While a student in Williamson high school, young Wagner was an active and popular member o the Newman Club and Troop No. 12 o the Boy Scouts. Before entering the Navy he was employed by Sam Thabit, businessman. Besides his mother, Wagner leaves four sisters, Dolores, Margaret, Janet and Mrs. Frank Schilling, and a brother, Forrest, all of Cincinnati.